Zheng-Ling Yang (Yang Zheng-ling, or Yang Zhengling in Chinese journals), male, associate professor. He was born in Lingshou county, Hebei province, China, in November, 1964. He graduated from Tianjin University in 1985, and has served as a teacher/lecturer in Tianjin University since then. He received the Ph.D. degree (Science Doctor in Engineering, in China degree system) from Tianjin University. He is a master supervisor in two specialties (approximatively corresponding to “department” abroad) of “Control Science and Engineering”and "Software Engineering". He is an IEEE member of “Power & Energy Society” and “Intelligent Transportation Systems Society”. He works at the Modern Electrotechnics and Electronics Technology Center, School of Electrical Engineering & Automation, Tianjin University. He has published more than 40 journal papers as first author. Among them more than 30 journal papers are published in science and technology research, more than 10 journal papers in teaching research. 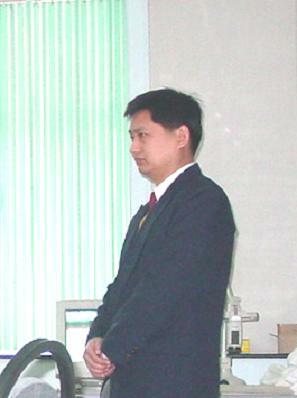 His papers can be found in the journals of “IEEE Trans on CAS-1”, “Chinese Physics Letters”, “Chinese Science Bulletin”, “Proceedings of the Chinese Society for Electrical Engineering”, “Power System Technology”; “Automation of Electric Power Systems”, “Philosophy Research”, “Journal of Tianjin University (Social Sciences)”, and “Journal of Chinese Traditional Medicine” and so on. His 10 papers are indexed by SCI-EXPANDED or Ei CompendxWeb. In recent years, he has been enrolled in many projects, such as the “National Electrotechnics Education Reformation” project (as a principal of a sub-project), the Tianjin Natural Science Foundation project, and some transverse subjects. He is selected into the large national literature and annals, “The Brilliant Course - Achievement and Exploration of 50 Years Since New China”. (3) Foundation of artificial intelligence. 杨正瓴（Yang Zheng-ling）. 第二类计算机构想（Conception of the second class computer）. 中国电子科学研究院学报（Journal of China Academy of Electronics and Information Technology）, 2011, 6(4): 368-374. 杨正瓴. 互容的定义和模型. 科学通报，1990, 35(12): 960. 刘鲁源，杨正瓴. 微型计算机间的并行通讯. 自动化与仪表，1986, (2): 18-21 （天津市自动化学会年会优秀论文，1985）. He is responsible for 3 courses: 1 for undergraduates, 2 for postgraduates for master’s degree. 1. Electrotechnics for undergraduates (national superfine course "introduction to electrical engineering" series, 2030323、2030324、2030388、2030389). (1) In artificial intelligence field, he presented a complexity hierarchy of knowledge, and the complexity estimation of human brain. Refer to “Philosophy Research” (4, 1999). (2) In forecasting theory and technology, he suggested “Mechanism model + identification model” strategy for prediction of complex systems’ behavior. Refer to “Sciencepaper Online” (2006, 200609-432), and “Highlights of Sciencepaper Online”, 2007, (1): 83-87. (3) A personal viewpoint about a FULL PROOF of “the P versus NP (P vs NP) problem”, in the Student Academic Symposium of Graduate School to Celebrate the 100th Anniversary of the Founding of Tianjin University, and the Symposium of Electric Power & Automation Engineering Department to Celebrate the 100th Anniversary of the Founding of Tianjin University, October, 1995. (4) In physics foundation field, he gave an explanation for the logic cause of the limit of velocity of light. Refer to “Journal of Tianjin University (Social Sciences)” (4, 2001). In addition, he focuses his attention on some fundamental problems in theoretical computer science, computing complexity, and theoretical physics. He graduated from Tianjin University in 1985, and has served as a teacher/lecturer in Tianjin University since then. He received the Ph.D. degree (Science Doctor in Engineering, in China degree system) from Tianjin University. He is a master supervisor in two specialties (approximatively corresponding to “department” abroad) of "Control Science and Engineering" and "Software Engineering". He works at the Modern Electrotechnics and Electronics Technology Center, School of Electrical Engineering & Automation, Tianjin University. He has published more than 40 journal papers as first author. Among them more than 20 journal papers are published in science and technology research, more than 10 journal papers in teaching research. His papers can be found in the journals of “IEEE Trans on CAS-1”, “Chinese Physics Letters”，“Chinese Science Bulletin”, “Proceedings of the Chinese Society for Electrical Engineering”, “Power System Technology”;“Automation of Electric Power Systems”, “Philosophy Research”, “Journal of Tianjin University (Social Sciences)”, and “Journal of Chinese Traditional Medicine” and so on. His 10 papers are indexed by SCI-EXPANDED or Ei CompendxWeb. In recent years, he has been enrolled in many projects, such as the “National Electrotechnics Education Reformation” project (as a principal of a sub-project), the Tianjin Natural Science Foundation project, and some transverse subjects. He is selected into the large national literature and annals, “The Brilliant Course - Achievement and Exploration of 50 Years Since New China”. (1) Foundation of artificial intelligence. (2) Chaos and its applications in electric power systems. (3) Forecasting/prediction of complex time series. He is undertaked a research project funded by Tianjin Natural Science Foundation （No. 09JCYBJC07700）. He is undertaking and undertaked many research projects funded by enterprises. He is responsible for 3 coursesNULL for undergraduates, 2 for postgraduates for master’s degree. (1) In artificial intelligence field, he presents a complexity hierarchy of knowledge, and the complexity estimation of human brain. Refer to “Philosophy Research” (4, 1999). (2) In chaos field, he notices the chaos characteristics of stochastic process with memory. Refer to “Automation of Electric Power Systems” (10, 2002). (3) In physics foundation field, he gives an explanation for the logic cause of the limit of velocity of light. Refer to “Journal of Tianjin University (Social Sciences)” (4, 2001). (4) In forecasting theory and technology, he suggests “Mechanism model + identification model” strategy for prediction of complex systems’ behavior. Refer to “Sciencepaper online” (2006，200609-432).